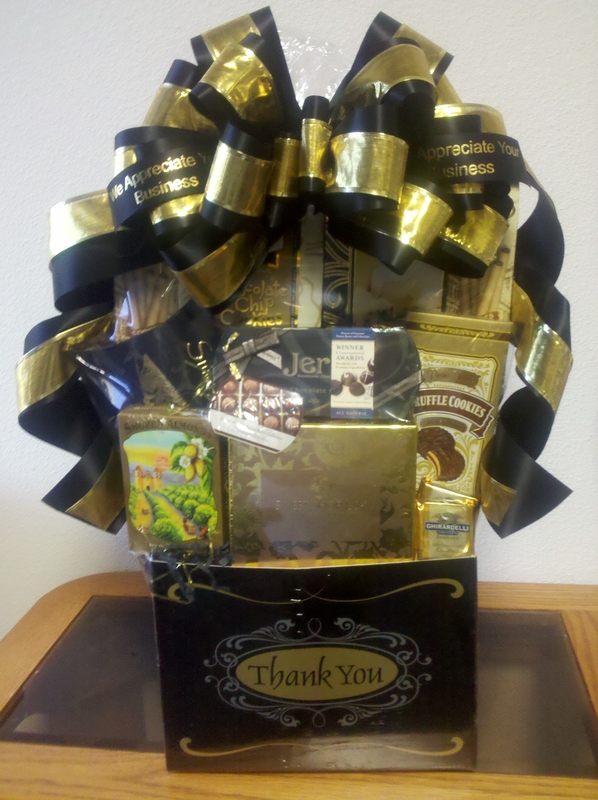 The Thank You Box makes a great employee gift and a personalized imprinted ribbon is included for free! Next Week (April 22nd – April 26th is Administrative Professional’s Week! It is a day to thank your entire team for their hard work, loyalty and dedication. Every employee wants to feel appreciated and to know that their work has not gone unnoticed. You may want a small gift for each employee or a large Office Party type basket for the whole team to share. The elegant black and gold Thank You Box is a great employee gift. Be sure to check out all the other choices on our Administrative Professional’s Day Page, or give us a call and we will custom design and personalize a gift to WOW that special Assistant or your whole team. Other popular gifts are: Pamper Yourself baskets, fresh cookies, Breakfast Pastry Appreciation Basket, Picnic On The Go, Office Bytes (computer theme), Chocolate Fantasy, Movie Night, You’re A Star, You Light Up The Office (beautiful blown glass candle vase and chocolates), Thanks For Helping Us Grow (A Planter filled with chocolates and confections), Treasured Assistant (A leatherette treasure chest with sweet and savory snacks), Break Time ( A giant ceramic mug filled with coffee, chocolates and confections) and much more.